Spot the red bull in Tamanche Pe Disco. There're reasons why we do not have union sets of commercial and non-commercial movies in taxonomy. It just doesn't go man. It's like saying you want to have khichdi with chole bhature. Likewise,Tigmanshu Dhulia shouldn't have served us this half-here-half-in-Salman-Khan's-Pocket movie. I had uber-duber high expectations from Bullet Raja cos A.Tigmanshu Dhulia(wohi wohi Ramadhir Singh) and B. I'm a half-UPite. While I usually diss away the UPite culture as being crass & urghhh..pleej okay so below my standardsss horn ok please, I secretly love the bhojpuri/whatever else UPite accent in movies because they make the characters so much more amusing. It's a kind of style I love in reel life but would barf out on in real life. Being also a half-Delhiite,my such hypocrisies are justified. In fact I'm more of a Delhiite than UPite but that's another thing I'm pardes mein rehne wali cultural identity crisis ki ambassador. Bullet Raja is a movie that starts well but digs it's own grave because of its unnecessary commercial ads after every 3 scenes. There's the good, bad and ugly. 1. The overarching themes & storyline was very interesting. It's on politics and power play with the combination of friendship and style. 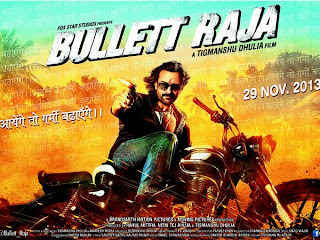 Based on a true story, Bullet Raja has depicted the nuances of UPite culture and politics pretty well. 2. Jimmy Sheirgill. I love this man. Wasn't a big fan of him when I first watched him in Mohabbatein but he had me at 'em gangster/nawab roles. His acting,screen presence is just very very classy. He doesn't overdo it. He somehow fits in any role you give him. I refuse to watch his punjabi movies because I'm afraid I might lose faith in the religion called JimmyS. 3. Saif Ali Khan. Despite being hit on the head with the wedding ring of Bebo, I think he finally made a wise decision in movies. I can't remember his last awesome movie. Was it Love Aaj Kal? Or something like that? In this movie,he's picked up the UPite language(including body ki),style & delivery of dialogues. It might be because he was formally trained under Ustad Vishal Bhardwaj during the making of Omkara or it might just be the Nawab's alter ego. Whatever it was,worked for him big time. 4. The language & dialogues. The two things Dhulia(Ramadhir yaar) managed to thankfully get right in this movie,which is probably what saved the movie whatever little bit it could. 1. Mahie Gill's Don't Touch My Body item & special appearance otherwise. Okay there's a highhhhhhh probability Dhulia meant to make her look super vulgar and cheap but listen dude,that was disturbing. Apart from the rickshawalas,I can't think of anyone who won't be cringing at her presence on screen. The song,the dance,the female in koschan,all was scary. Not aesthetically vulgar man. And I know you can do that,you've done that before in Saheb Biwi Aur Gangster & it's sequel. 2. Songs. While I mostly like the songs of the movie,none of them were required at any given point in the movie. Isiliye kaha Ramadhir Singh beta,tumse na ho paayega kawmursuhlaayisashun(commercialisation). Matlab it was heights of kuch bhi yaaaaaaaaaaaaaar. If you cropped out that behenji who's coming in EVERY Bollywood movie, you'll realise the movie is a decent watch. Ek toh woh,uske upar se uska character itna despo. I didn't get the need for her to wear brown contact lenses,they weren't helping her face look any better. I didn't get why and how and why does what she did in the movie. She was the flop commercial ads that mainly spoils the movie. As it is I can't stand her anymore given she's there in EVERY Bollywood movie,on top of that her redundant need in this movie. Minus her,the movie could've easily be made within 2 hours,or even slightly less. Sonakshi: Awww..chalo na mere-2-din-ke-miley-huye-pyaar, mera saath Kolkata chalo! Wahan hum dance karenge aur tumhaara mood theekh ho jaayega. Phir no oneeee would want to kill you. No oneeee. Overall, the movie is a timepass. It's nice,but I couldn't fall in love with it thanks to flop commercial ads. The dialogues and style are witty. Action is pretty refreshing and smart. Ravi Kishan could do without being Radha. I sometimes feel Raj Babbar is bad luck. Jis movie mein aata hai,movie pit jaati hai. From direction to background score,I've mixed sentiments on how I found it. Poor editing and bad decision of commercialising Dhulia. Bad decision. Spot ignore Delete the red bull from the movie.